Thammasat University students with the pumps Ebara has donated. Ebara Corp has donated pumps to Thammasat University in Thailand as part of the Japanese company’s international cooperation activities through technical guidance. The objective is to deepen students’ understanding of pump technology by experiencing real pumps during their classes. 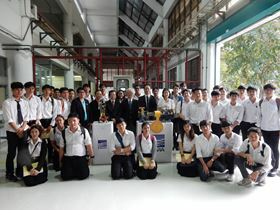 A pump seminar was held at Thammasat University on the day the pumps were donated. 100 university students who are studying mechanical engineering attended the seminar. During the seminar, there was a lecture on pump basics, cavitation and the water supply pump unit. Since the Ebara Hatakeyama Memorial Fund (EHMF) was established in 1989, Ebara has held more than 260 seminars around the world, attended by over 12 000 people. Ebara has held four seminars in FY2017. Ebara's pump seminar in Vietnam is attended by teachers and students from the College of Urban Works Construction.